The hottest Porsche model is the current Boxster, which is able to produce the output of 330 horsepower. However, the supercar manufacturer is working on a more powerful model. 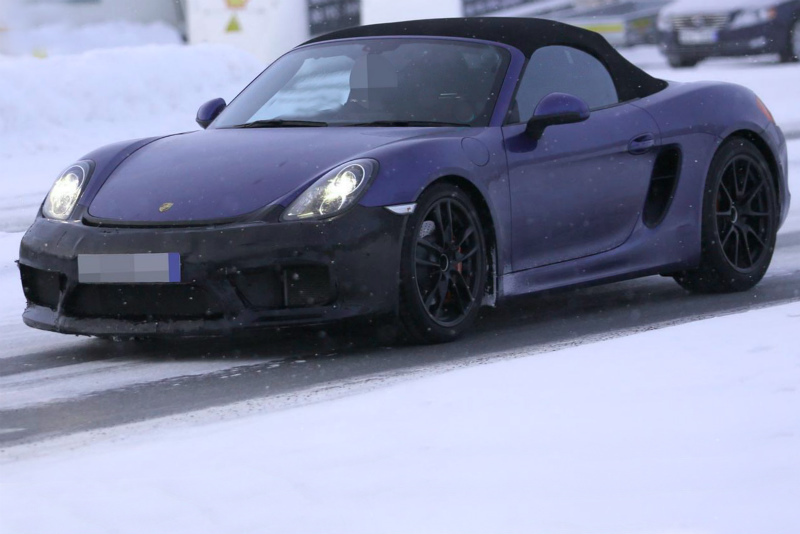 Currently, the next version of the Boxster is on testing in the cold weather. The Boxster’s prototype is based on the Cayman GT4 as well. The future novelty gets the similar aggressive front bumper, a new large wing spoiler and gets additional intakes. The new Boxster GTS is expected to be equipped with the 3.4-liter six-cylinder flat mounted engine, which is able to produce the output of 380 horsepower. Moreover, the novelty also gets updated suspension, braking system and wheels. The carmaker has used lightweight materials in construction such as carbon fiber to reduce the vehicle’s weight as well. The new Boxster will be equipped with the six-speed manual gearbox as standard and the brand’s seven-speed PDK dual-clutch gearbox will be offered as an optional feature. Meanwhile, the new Porsche’s model will not be offered under the GT4 badge but most likely, the novelty will be named the RS Spyder as well to honor the legendary racecar 718 RS 60 Spyder 1960. We will know more details and information on the Boxster RS Spyder, when it comes by the end of this year. Officially, the auto manufacturer has not announced pricing yet, but we suppose a basic version will be sold for 74,495 dollars as well. Moreover, the automaker has informed its decision to equip the updated models such as the Boxster and Cayman GT4 with only four-cylinder engines.